Sustainability for us is continuity, developing the present with a responsibility towards the coming generations. We maintain and practice a culture at our farms that preserves the environment, is socially conscious and is supportive of economic development. We work to infuse quality into life at our gardens. The use of natural farm inputs has rid the soil of chemical residues gifting the workers with safe drinking water. Healthy and non-polluted air has resulted in noticeable decline in respiratory diseases. The use of natural farm inputs has rid the soil of chemical residues gifting the workers with safe drinking water. Healthy and non-polluted air has resulted in noticeable decline in respiratory diseases. We work to harvest hydro energy through run of the river projects. The requirement of electricity for some of the tea factories, during the manufacturing season, is met through micro hydro projects running successfully at the estates. We aspire towards continued increase of reliance on clean energy and reduction of pollution through decreased use of non-renewal sources of energy. We strongly believe that a multi-pronged approach is needed towards sustainability. Hence we address it through the ‘Sustainability Framework’ – channelizing our efforts on Soil, Plants, Animals, Energy, Air and Water all together. As a result of sustainable activities of biodynamic and organic farming, use of renewable energy, low resource consumption, we are more than carbon neutral. This implies our operations are not only carbon neutral, but a significant amount of carbon is stored in our tea gardens. Theorganization has adopted methods to meet all the 17 United Nations Sustainable Development Goals. 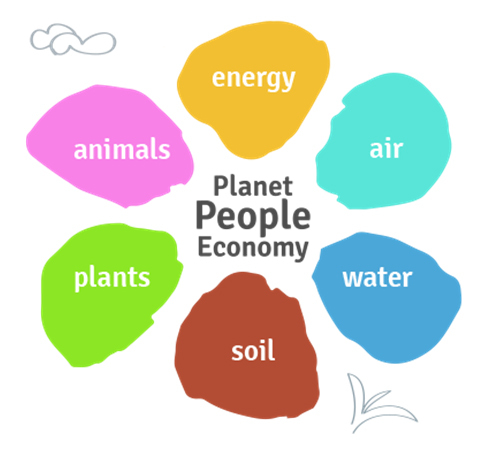 Our determined effort for a balanced eco system promises a healthy, happy and smiling planet to future generations.